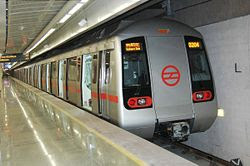 Government of India and the Government of National Capital Territory of Delhi, in equal partnership have set up a company named Delhi Metro Rail Corporation Ltd. under the Companies Act, 1956. The Delhi metro rail project presented a picture of success in front of whole world over passing the hurdles of bureaucracy, political stunts, corruption and other problems which generally occurs in the path of any Government project. It has been delivered before set schedule and within its budget limits. Metro rail runs on at a speed of 80 km per hour. 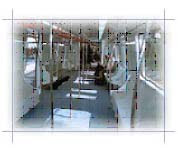 Delhi Metro provides a comfortable journey as the population of capital has increased from 57 lacs in 1981 to 162 in 2006. In 1980 approximately 5 lakhs vehicles were plying on the roads in while in 2007 more than 50 lacs vehicles are plying on the roads leading to problems of traffic jams, pollution, accidents on the roads due to traffic and increased number of vehicles, although the road network had been increased from time to time. Roads cover 25% area of city and still not sufficient as numbers of vehicles are growing at a very rapid speed and personally I would say that the people’s car ‘Nano’ by TATA will increased it like anything. The solution of above all problems is Delhi Metro Rail. Metro since its first journey in 2004 had greatly improved the situation and first railway project in the world to earn carbon credit. United Nations counted the metro under the Clean Development Mechanism. The number of riders has increased by 26% in year 2007. Twenty crores commuters have used metro in last year. In 2007 earnings of metro is 236 crores According to an estimate due to metro their will be 1600 less buses on the roads, saving of fuel and less pollution, less accidents on the roads. Metro currently run on three lines. First line from Shahdara to Rithala, Second from Vishwa Vidyalaya to Central Secretariat and third one from Indraprastha to Dwarka having total no. of 59 stations using high standards of safety. It Coaches are designed for comfort and safety and automatic door opening and closing mechanism automatic brakes in case of accidental opening of gates and facility for passengers to talk to driver in Emergency. The security of Metro has been equipped with latest and automatic safety equipments from CISF. Metro has been planned for complete NCR region the work is in progress for taking it Noida, Gurgaon and upto Nangloi. Metro rail provides facility of escalators on its stations with emergency stop button on top, bottom and middle. At last I can say metro has presented a role model to be followed for other congested metro cities.